Warning: There are MASSIVE spoilers ahead for Avengers: Infinity War. If you still haven’t seen the film, are you sure you’re on the right site? Last night, we were lucky enough to attend a special screening of Avengers: Infinity War with the Russo Brothers. The event – which was presented by Arclight Cinemas in Hollywood and hosted by Collider’s Steve Weintraub – featured an IMAX presentation of the film, followed by an extensive Q&A with Joe and Anthony Russo. During the nearly 2-hour chat moderated by Weintraub, a variety of topics were discussed with the directors. In their first extensive interview conducted for Infinity War since it’s release, the brothers shed some additional light on one of the most ambitious productions of all time. While the duo is hard at work on Avengers 4, they immediately made it clear to everyone that they wouldn’t be answering any questions about the upcoming film or it’s impending trailer. Joe even went as far to establish that an air-horn noise from his phone would play any time that Avengers 4 questions were asked. In short, don’t expect to learn anything about Avengers 4 from this Q&A. After Avengers 4 is completed, the Russo bros. are planning to take a break from comic book movies. Joe half-jokingly says they’ll come back if Marvel makes a Secret Wars movie. Principal photography on Infinity War and Avengers 4 lasted for nearly a year in total. When handing out scripts to the cast, Marvel redacted scenes so that actors only got the pages that they were in. In certain cases, fake scenes were used so that it would be misleading if the script were to be leaked. Infinity War and Avengers 4 entered pre production with the intention of shooting both simultaneously. This proved to be a nightmare in pre-production, so the movies were ultimately split up and shot back-to-back to avoid as much logistical confusion as possible. With that said, some scenes from both films were shot on the same day – mostly due to actor availability. Three “radically different” drafts of the script were written. The original draft was non-linear in structure, featured voiceover from Thanos and backstories for the Black Order. At 250 pages, this draft is what Joe Russo calls “the bible for the movie.” What he means by this is that it gave the filmmakers a lot of information about the characters and what they wanted to do with Thanos in particular. This information eventually gave them the subtext that would remain through the final film. Due to the amount of characters in the story, the filmmakers latched onto the idea of simplifying the plot as much as possible. This allowed the duo to focus on the character moments. Because these movies are complex and so many different people are involved, the directors prefer to go into production with a clear story arc in mind. At the same time, they are also open to ideas the actors bring onto set. When asked where the Hulk was when everyone was slaughtered on the Asgardian ship, they said, “it’s a very big ship.” Additionally they cited the fact that Banner and Hulk are “kind of having a thing.” That implied that Banner struggled to become the Hulk even before he appeared in the movie. There was a previous draft of the script which depicted the scene where Thanos acquired the power stone from Xandar. They ultimately settled on the film’s opening scene to “knock the audience off balance” and immediately define Thanos’ presence. When asked how Thanos was able to defeat Hulk, Joe Russo said, “He’s just that powerful.” While the Russos admit that Hulk is probably slightly stronger, his fighting style is a bit “mindless.” Joe Russo calls Thanos the “Genghis Kahn” of the MCU, due to his skilled fighting style and the fact that he’s much smarter. Marvel has a very “secretive” screening process that allows the filmmakers to find “surgical” ways of making the movie better. The filmmakers call this “plussing,” which is another way of saying additional photography. 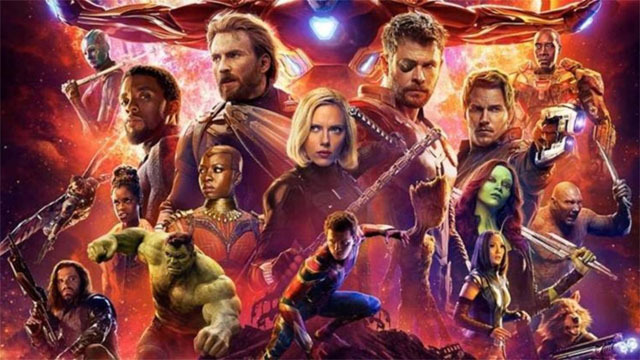 The shooting schedule allowed the filmmakers to grab pick-ups for Infinity War while they were shooting Avengers 4. An alternate opening scene was plussed where Dr. Strange arrived to grab Tony from his new home. Ultimately the park had more energy in it, so this alternate scene was cut. Besides that alternate scene and the ones presented on the Blu-ray, there were no additional scenes left on the cutting room floor. The directors are “very accurate and efficient” when it comes to their story work. As a result, they admit to being very hard on their scripts and they are also “aggressive” with the development of them. When asked how they were approached about helming the movie(s), they jokingly mentioned that they had to “wrestle Joss Whedon.” They cited Civil War as “setting the stage” for what would become Infinity War, making the transition seamless. When asked to describe what Josh Brolin looked like on set, Joe Russo described the motion capture getup as “ridiculous.” The actor said that doing the performance capture felt like doing experimental theater. Actor availability helped shaped the film. Anthony Russo says that they had to be very “judicious” about scheduling the production. Russo also made a point that “the tail doesn’t wag the dog” in terms of story. In other words, story and creativity are paramount; everything else comes as a result of that. The first scene of the production was the scene where Tony, Peter and the Guardians of the Galaxy make the plan on Titan. Scheduling wise, all of Guardians scenes were front-loaded. On certain occasions, actors in the same scenes were not available on the same day. As a result, the production would be forced to stage the scene and shoot only one actor’s side of the scene with a stand-in. Then, several months later, the filmmakers would then need to re-stage the scene to shoot the other side of the scene. When asked how Stormbreaker is able to withstand the blast of the fully powered gauntlet, the directors said that Eitri made both weapons – implying that they are equally as powerful. Joe also mentioned that Stormbreaker “has the ability to counteract the powers of the gauntlet,” and that Thanos wasn’t expecting it. There was never a much longer version (assembly cut) of the movie. The directors tried to be studious about putting an emphasis on pacing and forward momentum. When asked about the Red Skull cameo, Joe says that they needed someone on Vormir “who the audience could trust” to explain the rules of how to obtain the soul stone. Screenwriters Christopher Markus and Stephen McFeely – who also wrote Captain America: The First Avenger – championed the Red Skull’s inclusion. The Russos also said that Hugo Weaving “was asked” to return. When asked if Vision could still be part of the mind stone, the directors dodged the question, That appeared to imply that this could be an element of Avengers 4. There were discussions of including the Marvel Netflix characters, but it would have ultimately convoluted the movie. Black Panther and Infinity War were both going into production around the same time in Atlanta. The Russos met with Ryan Coogler and his design team, who walked the brothers through an “incredibly elaborate and beautiful presentation” to give them an idea of what was happening with that film. The brothers had a full-scale Infinity Gauntlet built for practical reference when shooting. When asked about crafting Chris Hemsworth’s performance, the Russos admitted that Thor: Ragnarok had a big influence on the direction the character in Infinity War. Thor: Ragnarok was also shooting around the same time as Infinity War, so it “took a lot of conversations” between Hemsworth, Taika Waititi, and the Russos to find Thor’s arc. According to Joe, the hardest and most complicated VFX sequences were the Battle(s) of Titan and Wakanda, despite praising the Thanos work. The film was shot mostly using single camera setups, except for when action or stunts are involved. When asked if an adaptation of Secret Wars might ever get made, they put an emphasis on focusing on the present more than the future. When asked about the character pairings that they eventually landed on, Joe described “cards with magnets that would shift all the time.” They explored just about “every possible pairing” of characters. The Russos brought Marvel Studios head-honcho Kevin Feige early into the process of crafting the story, while Disney CEO Bob Iger came in later after the physical production is finished. The brothers jokingly cited Groo The Wanderer as an origin story that they want to adapt in the future. However, Groo is not a Marvel character. Although the script was solidified going into shooting, Anthony cited that the scene where the Guardians meet Thor “took on a whole new life” once the actors got a hold of it on set. Joe called Thor’s entrance in Wakanda as a moment “that makes you think the good guys are going to win.” This was intentional misdirection on the part of the brothers. The filmmakers weren’t sure if they could pull off as many characters as they did, mostly due to the film’s unique structure. Joe also called Thor’s arrival in Wakanda as one his favorite moments in the movie, although some of the more emotional moments were their favorites as well. What was the most intriguing revelation from the Russo brothers’ Avengers: Infinity War Q&A? Let us know in the comment section below!